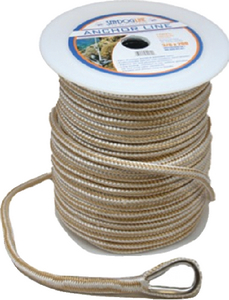 100% premium double braided nylon anchor lines have excellent flexibility and stretch to absorb shock with a soft feel. T&H Marine AR1DP Anchor Master Retrival System | T&H Marine AR01DP Anchor Retriever Ring Only | Windline PM1 Bracket Anchor Rail Mount | Windline PM2 Stanchion Mount Anchor Bracket | Windline W30 Wheel Marithane 3" X 3.4" | Windline W40 Wheel Marithane 4" X 3.4" | Perko 0757DP0CHR Pipe Rope Deck for 1" Rope | Perko 0903DP2CHR Anchor Chocks | Perko 1057DP0BLK Rope Deck Pipe Plastic Black | Perko 1057DP0WHT Rope Deck Pipe Plastic White | Johnson 462501 Anchor Chain Tensioner To 5/16 | Seachoice 33021 Hinged Rope Deck Pipe Chr/Bras | Seadog 3220801 Pipe Deck Chain Hinged Chr. | Seadog 3220751 Replacement Cap & Chain | Seadog 322070 Deck Pipe Chr Brass,w/Chain | Danforth 95105 3/16" X 3' Vinyl Coated Chain | Danforth 95131 3/16" X 4' Galvanized Chain | Danforth 95132 1/4" X 6' Galvanized Chain | Danforth 95133 5/16" X 6' Galvanized Chain | Danforth 95134 1/4" X 5' Galvanized Chain | Boater Sports 50604 1/4" x 4' Galvanized Anchor Chain | Boater Sports 50601 1/4" x 4' Coated Galvanized Anchor Chain | Boater Sports 55004 3/8" Stainless Steel Anchor Shackle | Boater Sports 55034 3/8" Hot-Dipped Galvanized Anchor Shackle | Boater Sports 55038 5/8" Hot-Dipped Galvanized Anchor Shackle | Boater Sports 50704 Zinc Plated Anchor Locking Control | Boater Sports 52995 1/4" x 50' Hollow Braid Anchor Line | Boater Sports 52996 1/4" x 100' Hollow Braid Anchor Line | Boater Sports 53477 3/8" x 100' Hollow Braid Anchor Line | Boater Sports 52978 3/16" x 100' Solid Braid Anchor Line | Boater Sports 52709 3/8" x 100' 3-Strand Anchor Line | Boater Sports 52710 3/8" x 150' 3-Strand Anchor Line | Boater Sports 52714 1/2" x 100' 3-Strand Anchor Line | Boater Sports 52727 3/8" x 150' Double Braid Anchor Line | Boater Sports 52729 1/2" x 150' Double Braid Anchor Line | T&H Marine ALC1DP Anchor Handle Lid Lock-Black Base-Chrome Handle-Locking | T&H Marine AR0DP Anchor Master Retrieval System Without Buoy | Dock Edge 90030F Chain Collar, Fits 1-7/8" dia. | Dock Edge 90032F Center Rod & Swivel | Tie Down 95170 Anchor Shakles - 1/4" Galvanized | Tie Down 95135 Galvanized Anchor Chain - 5/16" x 6' | Seadog 170002 Thimble SS Heavy Duty 1/16IN | Seadog 170003 Thimble SS Heavy Duty 1/8IN | Seadog 170004 Thimble SS Heavy Duty 5/32IN | Seadog 170005 Thimble SS Heavy Duty 3/16IN | Seadog 170006 Thimble SS HD 1/4IN 7/32IN | Seadog 170008 Thimble SS HD 5/16IN 9/32IN | Seadog 170009 Thimble SS Heavy Duty 3/8IN | Seadog 170012 Thimble SS Heavy Duty 1/2IN | Seadog 170016 Thimble 5/8IN H.D. SS | Seadog 170020 Thimble SS Heavy Duty 3/4IN | Seadog 172010-1 Thimble 3/8IN Galv 2/CD | Seadog 172016 Galvanized Wire Rope Thimble | Seadog 172019 Galv Wire Rope Thimble 3/4IN | Seadog 173551 Thimble Nylon Standard 1/4IN | Seadog 173552 Thimble Nylon Standard 5/16IN | Seadog 173553 Nylon Thimble (white) 3/8 In | Seadog 173554 Nylon Thimble (white) 1/2 In | Seadog 173556 Nylon Thimble (white) 5/8 In | Seadog 173557 Thimble Nylon Standard 3/4IN | Seadog 181110 Galvanized Eye and Eye Swivel | Seadog 181208 Galv Eye & Jaw Swivel 5/16 | Seadog 181210 Swivel Shackle 3/8 Galv | Seadog 181212 Jaw & Eye Swivel 1/2IN | Seadog 181216 Swivel 5/8 | Seadog 182106 SS Swivel Eye & Eye 1/4 In | Seadog 182108 SS Swivel Eye & Eye 5/16IN | Seadog 182110 SS Swivel Eye & Eye 3/8 In | Seadog 182210 SS Swivel Eye & Jaw 3/8IN | Seadog 182306 SS Swivel Jaw & Jaw 1/4IN | Seadog 182308 SS Jaw & Jaw Swivel 5/16" Bulk | Seadog 182308-1 SS Jaw and Jaw Swivel 5/16" | Seadog 182310 Jaw & Jaw Swivel 3/8IN | Seadog 300095-3 Hand Held Deluxe Rope Cutter | Seadog 300097-3 Hand Held Economy Rope Cutter | Seadog 301110060WH-1 Anchor Line Wh 3/8"X60' 1/PK | Seadog 301110100WH-1 Anchor Line Wh 3/8"X100' 1/PK | Seadog 301110150WH-1 Anchor Line Wh 3/8"X150' 1/PK | Seadog 301112100WH-1 Anchor Line Wh 1/2"X100' 1/PK | Seadog 301112150WH-1 Anchor Line Wh 1/2"X150' 1/PK | Seadog 302110100G/W-1 Anchor Line Dbl Gold 3/8"X100' | Seadog 302110150G/W-1 Anchorline Dbl GLD3/8X150 1/PK | Seadog 302110200G/W-1 Double Brd Nyl Al 3/8X200 G/W | Seadog 302110250G/W-1 Double Brd Nyl Al 3/8X250 G/W | Seadog 302112100G/W-1 Anchor Line Dbl Gold 1/2"X100' | Seadog 302112150G/W-1 Anchorline Dbl Gld 1/2X15 1/PK | Seadog 302112200G/W-1 Anchor Line Dbl Gold 1/2"X200' | Seadog 302112250G/W-1 Double Brd Nyl Al 1/2X250 G/W | Seadog 302112300G/W-1 Double Brd Nyl Al 1/2X300 G/W | Seadog 303303050WH-1 Sld Brd PLYCRD(HANK)1/8X50'WHT | Seadog 304206050YW-1 Anchorline Poly 1/4X50'YEL1/PK | Seadog 304206100YW-1 Poly Anc Line Snap 1/4X100 Yel | Seadog 304210075YW-1 Poly Anc Line Snap 3/8X75 Yel | Seadog 304210100YW-1 Poly Anc Line Snap 3/8X100 Yel | Seadog 321800 Stainless Chain Deck Pipe | Seadog 321820-1 Stainless Chain Stopper 3/16 | Seadog 321825-1 Stainless Chain Stopper 5/16 | Seadog 563310-1 Multi Purpose Cutter | Seadog 563320-1 HD Canvas & Upholstry Scissors | Seachoice 40201 Hollow Braid Poly Anchor Line | Seachoice 40211 Anchor Line 3/8IN X 75FT | Seachoice 40221 Solid Braid Nylon Anchor Line | Seachoice 40231 3/8IN X 50FT Sld Brd with Snap Ho | Seachoice 40691 Nylon Anchor Line Wht 3/8 X50 | Seachoice 40711 Nylon Anchor Line Wht 3/8X100 | Seachoice 40721 Nylon Anchor Line Wht 3/8X150' | Seachoice 40731 Nylon Anchor Line Wht 1/2X100 | Seachoice 40741 Nylon Anchor Line Wht 1/2X150 | Seachoice 40751 Nylon Anchor Line 1/2 X 200 | Seachoice 40781 Nylon Anchor Line 1/2" X 250' | Seachoice 42101 Anch Line Wht Brd 3/8 X 100 | Seachoice 42111 Anch Line Wht Brd 3/8 X 150 | Seachoice 42121 Anch Line Wht Brd 1/2 X 100 | Seachoice 42131 Anch Line Wht Brd 1/2 X 150 | Seachoice 42141 Anch Line Wht Brd 1/2 X 200 | Seachoice 42151 Anchor Line Yel Brd 3/8INX100F | Seachoice 42161 Anchor Line Blue Brd 3/8INX100 | Seachoice 42171 Anchor Line Red Brd 3/8INX100F | Seachoice 42181 Anchor Line Green Brd 3/8INX10 | Seachoice 42201 Anch Line Blk Brd 3/8 X 100 | Seachoice 42211 Anchor Line Teal Brd 3/8INX100 | Seachoice 42221 Anchor Line Navy Brd 3/8INX100 | Seachoice 42231 Anchor Line Purp Brd 3/8INX100 | Seachoice 42241 Anchor Line Burg Brd 3/8INX100 | Seachoice 42251 Anchor Line Blue Brd 1/2INX150 | Seachoice 42261 Anchor Line Red Brd 1/2INX150F | Seachoice 42271 Anchor Line Green Brd 1/2INX15 | Seachoice 42281 Anchor Line Blk Brd 1/2INX150F | Seachoice 42291 Anchor Line Teal Brd 1/2INX150 | Seachoice 42311 Anchor Line Gld/W Brd 5/8X250 | Seachoice 42321 Anchor Line Gld/W Brd 3/8INX10 | Seachoice 42331 Anchor Line Gld/W Brd 3/8INX15 | Seachoice 42341 Anchor Line Gld/W Brd 3/8INX20 | Seachoice 42361 Anchor Line Gld/W Brd 1/2X100 | Seachoice 42371 Anchor Line Gld/W Brd 1/2X150 | Seachoice 42381 Anchor Line Gld/W Brd 1/2X200 | Seachoice 42391 Anchor Line Gld/W Brd 1/2X250 | Seachoice 43330 Rope Thimble Galv 3/8 Bulk | Seachoice 43340 Rope Thimble Galv 1/2 Bulk | Seachoice 43341 Rope Thimble Galv 1/2 | Seachoice 43350 Rope Thimble Galv 5/8 Bulk | Seachoice 43351 Rope Thimble Galv 5/8 | Seachoice 43370 Rope Thimble SS 5/8" Bulk | Seachoice 43380 Rope Thimble SS 3/4" Bulk | Seachoice 43500 Eye & Eye Swivel Hdg 1/4" | Seachoice 43510 Eye & Eye Swivel Hdg 5/16" | Seachoice 43520 Eye & Eye Swivel Hdg 3/8" | Seachoice 43530 Eye & Eye Swivel Hdg 1/2" | Seachoice 43540 Eye & Eye Swivel Hdg 5/8" | Seachoice 43550 Eye & Eye Swivel Hdg 3/4" | Seachoice 43560 Eye & Eye Swivel Hdg 1" | Seachoice 43600 Jaw & Eye Swivel Hdg 1/4" | Seachoice 43610 Jaw & Eye Swivel Hdg 5/16" | Seachoice 43620 Jaw & Eye Swivel Hdg 3/8" | Seachoice 43630 Jaw & Eye Swivel Hdg 1/2" | Seachoice 43640 Jaw & Eye Swivel Hdg 5/8" | Seachoice 43650 Jaw & Eye Swivel Hdg 3/4" | Seachoice 43660 Jaw & Eye Swivel Hdg 1" | Seachoice 47691 Anch Line with Tracer 3/8" X 50' | Seachoice 47711 Prem Anchor Line 3/8" X 100' | Seachoice 47721 Anch Line with Tracer 3/8" X 150' | Seachoice 47731 Anch Line with Tracer 1/2" X 100' | Seachoice 47741 Anch Line with Tracer 1/2" X 150' | Seachoice 47751 Anch Line with Tracer 1/2" X 200' | Seachoice 47781 Anch Line with Tracer 1/2" X 250' | Seachoice 47911 Anch Line with Tracer 3/8" X 200' | Seachoice 47921 Anch Line with Tracer 5/8" X 200' | Seachoice 47931 Anch Line with Tracer 5/8" X 250' | Seachoice 48001 Tie Down Cord 3/16" X 1000' | Seachoice 48011 Tie Down Cord 7/32" X 1000' | Seachoice 48021 Tie Down Cord 1/4" X 1000' | Seachoice 79911 Replacement Rope Cutting Knife | Cal June 1502RL Rope Lock for 1502 | Chicago Hardware 215053 Swivel Eye & Eye 1/4 Galv | Chicago Hardware 215107 Swivel Eye & Eye 5/16 Galv | Chicago Hardware 215152 Swivel Eye & Eye 3/8 Galv | Chicago Hardware 215206 Swivel Eye & Eye 1/2 Galv | Chicago Hardware 215251 Swivel Eye & Eye 5/8 Galv | Chicago Hardware 216050 Swivel J&E 1/4 Galv SS Cotter | Chicago Hardware 216104 Swivel J&E 5/16 Galv SS Cotter | Chicago Hardware 216159 Swivel J&E 3/8 Galv SS Cotter | Chicago Hardware 216203 Swivel J&E 1/2 Galv SS Cotter | Chicago Hardware 216258 Swivel J&E 5/8 Galv SS Cotter | Chicago Hardware 216302 Swivel J&E 3/4 Galv SS Cotter | Chicago Hardware 221153 Thimble Heavy Duty Galv 3/8IN | Chicago Hardware 221252 Thimble Heavy Duty Galv 1/2IN | Chicago Hardware 221306 Thimble Heavy Duty Galv 5/8IN | Chicago Hardware 221351 Thimble Heavy Duty Galv 3/4IN | Chicago Hardware 221405 Thimble Heavy Duty Galv 7/8IN | Chicago Hardware 221450 Thimble Heavy Duty Galv 1IN | Chicago Hardware 225205 Thimble Rope Galv 5/16IN | Chicago Hardware 225250 Thimble Rope Galv 3/8IN | Chicago Hardware 225304 Thimble Rope Galv 7/16IN | Chicago Hardware 225359 Thimble Rope Galv 1/2IN | Chicago Hardware 225403 Thimble Rope Galv 5/8IN | Chicago Hardware 225458 Thimble Rope Galv 3/4IN | Chicago Hardware 225557 Thimble Rope Galv 1IN | Seadog 182306-1 Swivel | Scotty 276 Anchor Pulley/Lock | Ironwood Pacific 2 Anchorlift Anchor Retriever | Ironwood Pacific 21 Anchor Lift with Std. Red Buoy | Ironwood Pacific 24 Anchor Lift Ring Assembly | New England Ropes 539K62400015 Mooring Pendant 3/4X15 Thimble | New England Ropes 539K62400020 Mooring Pendant 3/4X20 Thimble | New England Ropes 539K63200020 Mooring Pendant 1X20 Thimble | New England Ropes 54T03-24-00006 Cyclone Mooring Pendant 3/4X6 | New England Ropes 54T03-24-00008 Cyclone Mooring Pendant 3/4X8 | New England Ropes 54T13-32-00012 Cyclone Mooring Pendant 1X12 | New England Ropes 54T13-32-00020 Cyclone Mooring Pendant 1X20 | New England Ropes 54T93-16-00006 Cyclone Mooring Pendant 1/2X6 | New England Ropes 54T93-16-00008 Cyclone Mooring Pendant 1/2X8 | New England Ropes 54T93-20-00005 Cyclone Mooring Pendant 5/8X5 | New England Ropes 54W23-24-00012 Cyclone Mooring Pendant 3/4X12 | New England Ropes 629K02000012 3 Strand Moor Pendant 5/8X12 | New England Ropes 629K02000015 3 Strand Moor Pendant 5/8X15 | New England Ropes 629K02400012 3 Strand Moor Pendant 3/4X12 | New England Ropes 629K02400015 3 Strand Moor Pendant 3/4X15 | New England Ropes 629K02400020 3 Strand Moor Pendant 3/4X20 | New England Ropes 629K03200020 3 Strand Moor Pendant 1X20 | New England Ropes 62H101600150 Chain Rode 1/2 X 150 | New England Ropes 62H201600200 Chain Rode 1/2 X 200 | New England Ropes 62H201600250 Chain Rode 1/2 X 250 | New England Ropes 62H301800150 Chain Rode 9/16 X 150 | New England Ropes 62H401800200 Chain Rode 9/16 X 200 | New England Ropes 90300000000 Cordage Meter | New England Ropes 90320000000 Mount Only For Cordage Meter | New England Ropes 50H402000150 Megaplait Chain Rode 5/8"X150' | New England Ropes 50H402000250 Megaplait Chain Rode 5/8"X250' | New England Ropes 50H801600150 Megaplait Chain Rode 1/2"X150' | New England Ropes 50H801600250 Megaplait Chain Rode 1/2"X250' | New England Ropes 539K62000012 Mooring Pendant 5/8X12 Thimble | New England Ropes 539K62000015 Mooring Pendant 5/8X15 Thimble | New England Ropes 539K62400012 Mooring Pendant 3/4X12 Thimble | Seachoice 30131 Fender Eyes 1 Pr/Cd | Seadog 300090-3 120V Rope Cutter | Ironwood Pacific 22 Anchor Lift with Large Buoy 16IN | Seadog 302110060G/W-1 Anchor Line Premium 60'X3/8" | Seadog 302112060G/W-1 Anchor Line Premium 60'X1/2" | Seadog 172005-1 Thimble 3/16IN Galv 2/CD | Seadog 303304050-1 Cordage Utility 5/32" X 50' | Seadog 303305050-1 Cordage Utility 3/16" X 50' | Seachoice 43331 Rope Thimble Galv 3/8 2/PK | Seachoice 43391 Rope Thimble SS 3/16 (2/CARD) | Seachoice 43401 Rope Thimble SS 1/4 (2/PK) | Seachoice 43411 Rope Thimble SS 5/16 (2/PK) | Seachoice 43421 Rope Thimble SS 3/8 (2/PK) | Seachoice 43431 Rope Thimble SS 1/2 (2/CARD) | Seadog 321822-1 SS Chain Stopper 3/16" 1/4" | Seadog 321832-1 Chain Stopper S.S.